Cioppino was well represented by pastry chef Meghann Walsh and asst. GM Dominick Mastrogiacoma, who served Dark Chocolate Truffles, Chocolate Covered Bacon, Chocolate Bourbon Pecan Balls, Chocolate Turtles, and Chocolate Marshmallow. 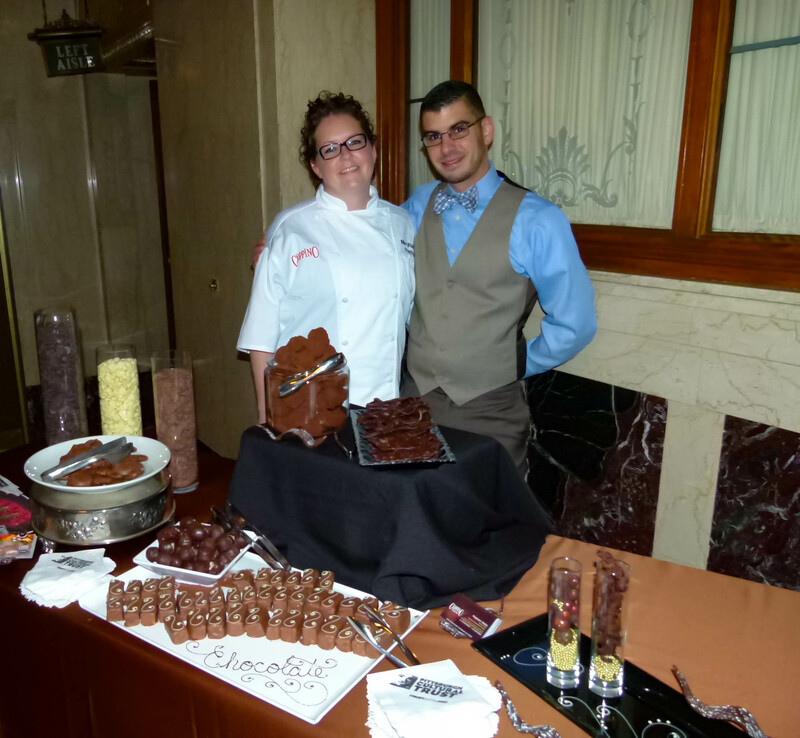 The ornate lobby and promenades of Benedum Center were recently turned into a showcase of chocolate creations from some of the city’s best restaurants and chocolatiers. 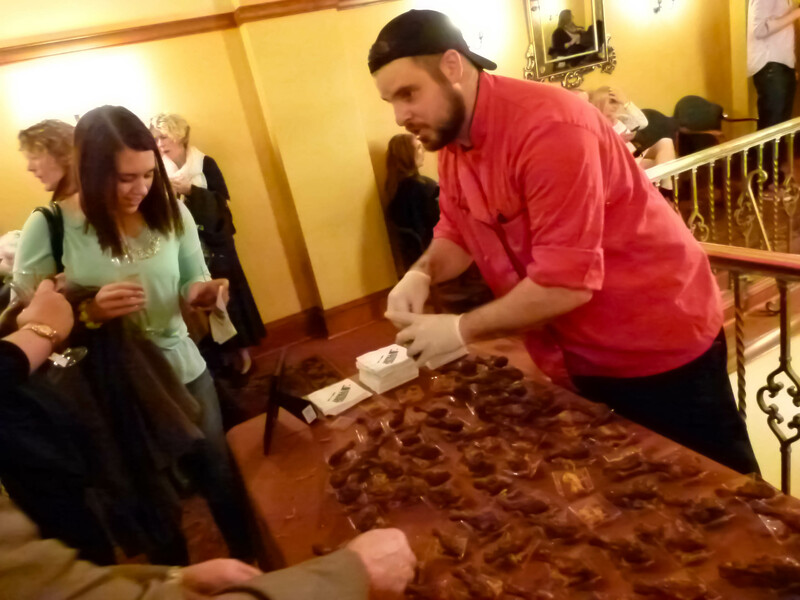 The Chocolate Bar, a fundraiser for the Pittsburgh Cultural Trust held this past Saturday night, featured chocolate treats for attendees to both admire and consume. On the adventurous side were Superior Motors chef Kevin Sousa’s Chocolate Cylinder, Vallozzi’s Chocolate Ravioli, and Tonic Bar & Grill’s Candied Butternut Squash Chocolate Lollipops with Spiced Nuts. For those whose tastes are a little more on the simpler side, there was Bill’s Bar & Burger’s Milk Chocolate Campfire Pudding and a fine chocolate cake from Monterey Bay Fish Grotto. Also on hand were the slightly pedestrian, but oh so tasty, chocolate covered pretzels and several different flavors of malted milk balls from local chocolate purveyors Sarris Candies and The Chocolate Moose respectively. More of a cookie person? Gaby et Jules brought different flavored macarons and The Capital Grille baked a big batch of chocolate cookies for devouring. There was even a station where you could decorate your own piece of chocolate candy, and the bars offered chocolate-inspired cocktails in addition to their regular items. A big slice of entertainment was also served with aerialist Kelsey Keller, DJ SMI, the band Delicious Pastries, and NBC’s “The Voice” finalist Mia Z. A Haute Chocolate fashion show went on throughout the evening with models wearing outfits from local artists; the show was curated by Richard Parsakian. 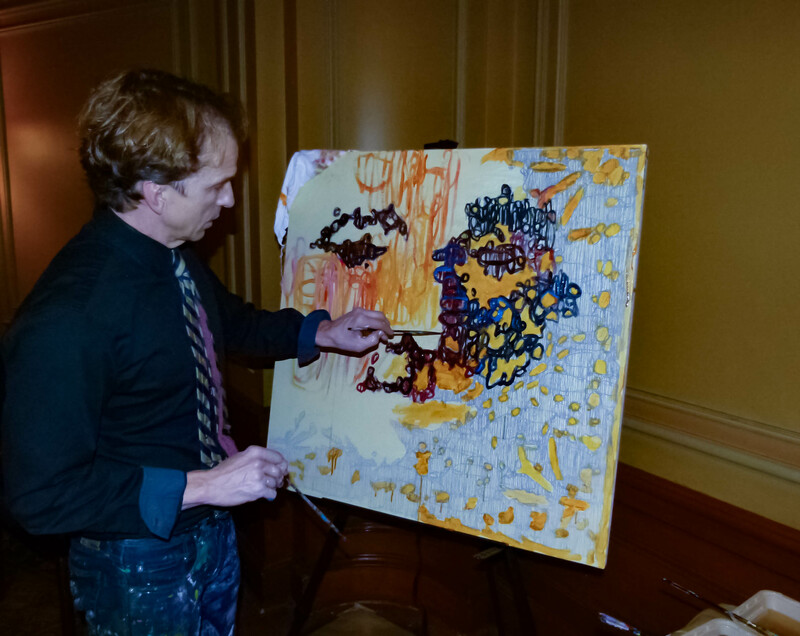 Artist Tom Mosser worked on a painting with regular paint and different flavors (and colors) of Hershey’s Syrup. 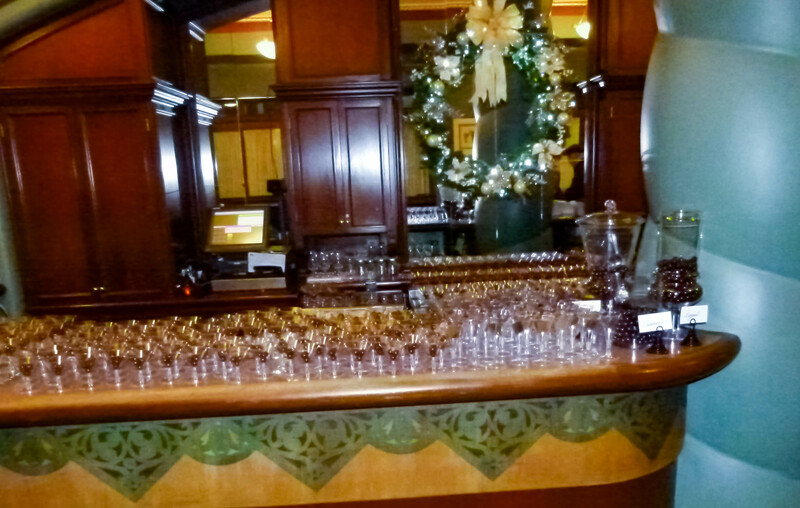 At only $25, The Chocolate Bar Fundraiser offered a great deal of value. Included with admission was a lot of delicious chocolate, a drink ticket, and a one-year membership to the Cultural Trust. 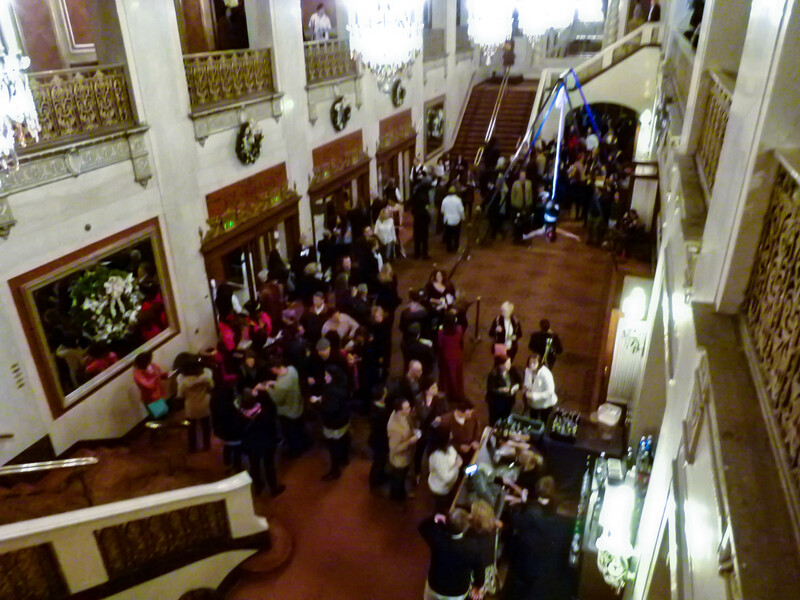 The event sold out weeks in advance and was produced by Acrobatique and the Pittsburgh Cultural Trust. Here’s hoping for a river of chocolate next year! Please click on photo below to activate event photos slideshow. 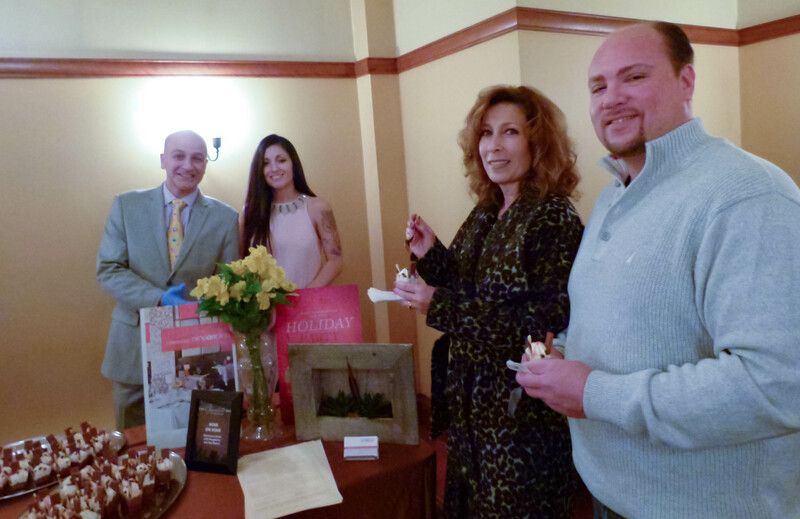 Chocolate lovers stream into the gorgeous lobby of the Bennedum Center at the start of the event. 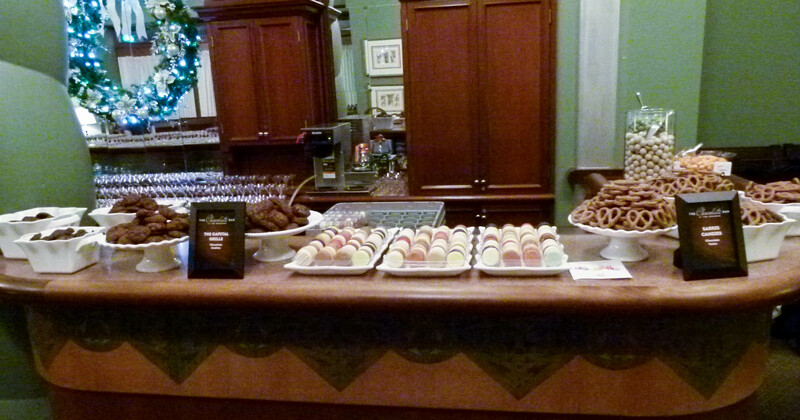 Some of the many chocolate offerings that ran along the Circles Lounge bar before the chocolate-craving hordes descended. Other treats on the rest of the Circles Lounge bar. 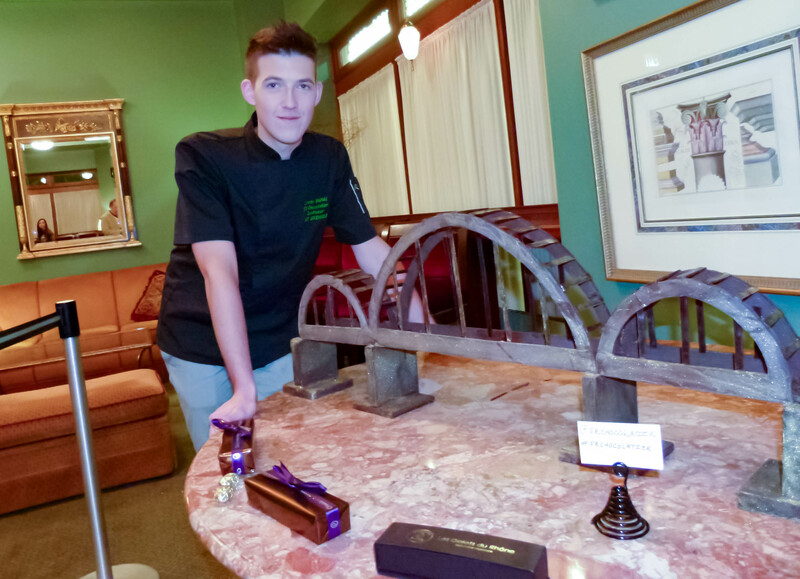 Corentin Vignal, an artisan chocolate maker from Chocolaterie Panel in Lyon, France, shows the bridge he created of dark Venezuelan chocolate. Jason Perla and Jolene Schiavoni (background), from Nine on Nine, wait for Stephanie Newmont and Greg Cerbin to dig in to their Chocolate Noire with Raspberry and Pop Rocks. Anastasia Crankovic (L) is dressed in a costume by Carol Luckner, with chocolate kiss buttons, while Nikki Knox wears a costume by Richard Parsakian. Hair and makeup by Izzazu Salon. Luckily for event attendees, chef Kevin Sousa took a break from work on developing his new restaurant, Superior Motors, to create a very unique and delectable chocolate dish. Sousa is seen here preparing a Chocolate Cylinder with Whipped Chestnut, Mushroom-Pecan Praline, and Wild Herbs. Ashley Cannon is in the background assisting. 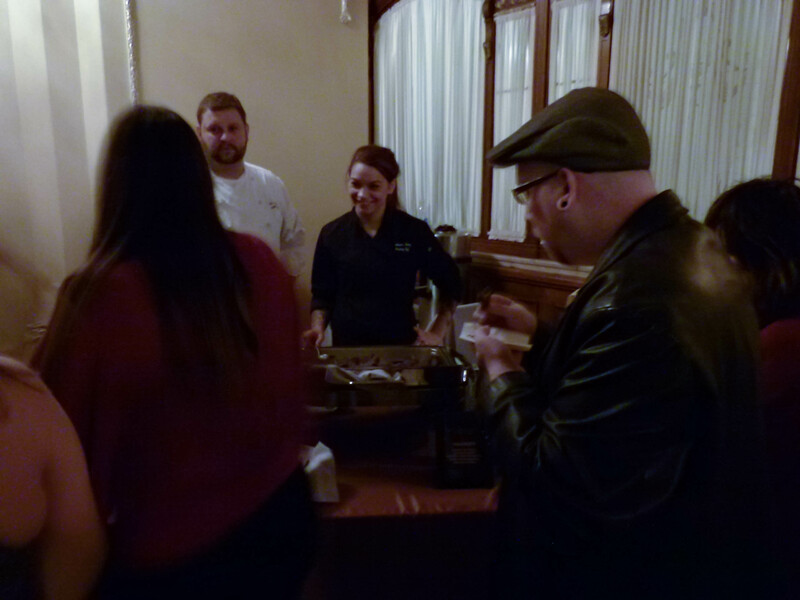 People line up for Valozzi's Chocolate Ravioli with Chocolate Ganache, Vanilla and Pomegranate served by Josiah Henry and Tabrina Avery. Pittsburgh artist Tom Mosser created a painting using regular paint and different kinds of Hershey's Syrup. 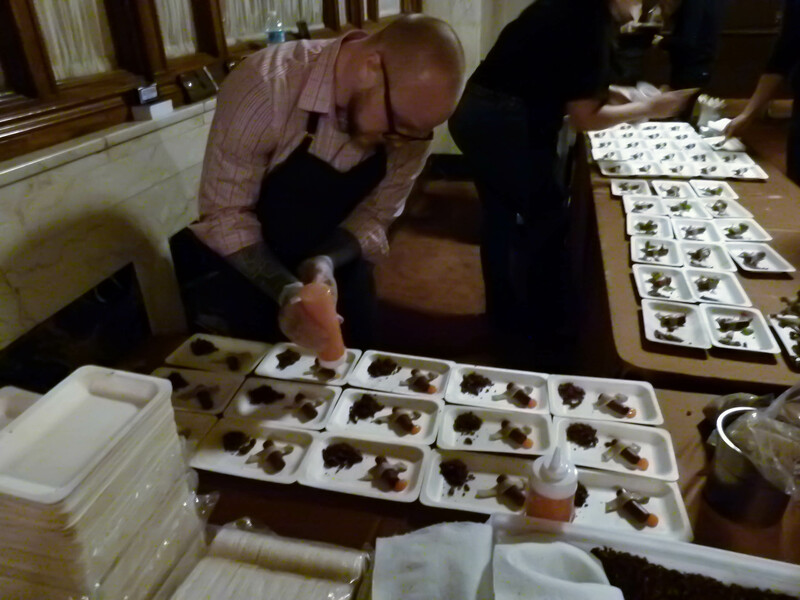 Josh Shamis from Braddock's Pittsburgh puts the finishing touches on Confit Chicken Drumsticks, Mole Sauce, with a Carrot and Ginger Relish. 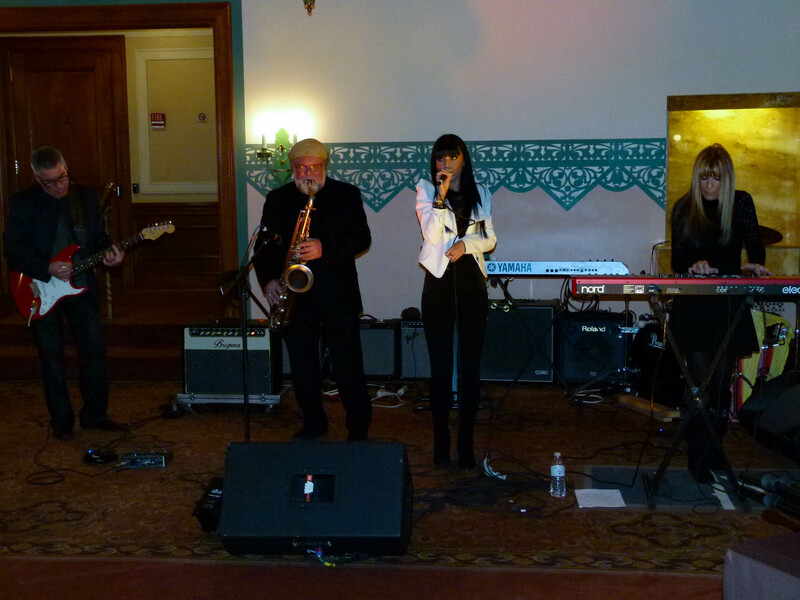 Mia Z, a finalist in NBC's 'The Voice,' performs with her band. 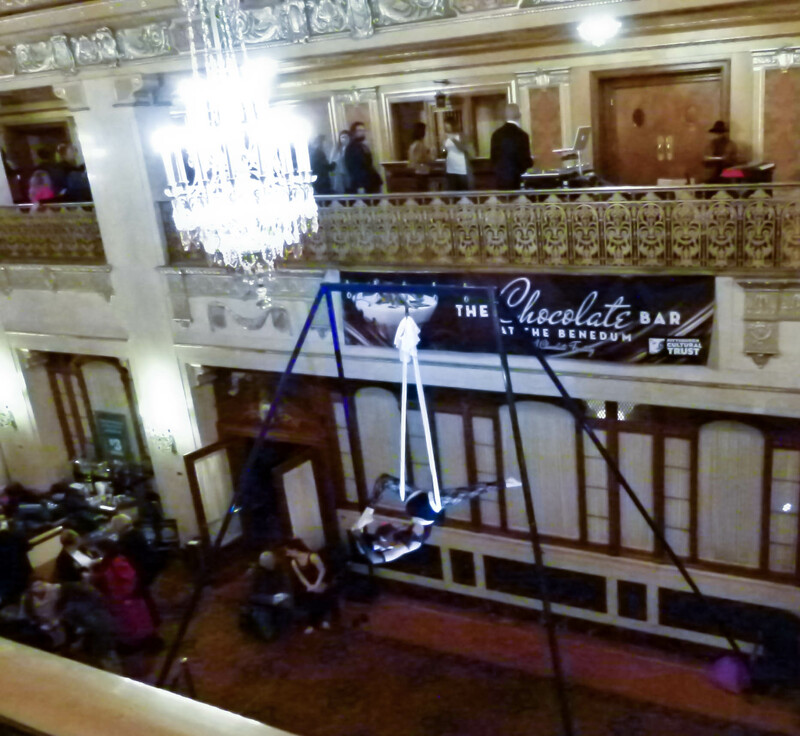 Kelsey Keller from Iron City Aerialists performs under the lobby's chandelier. 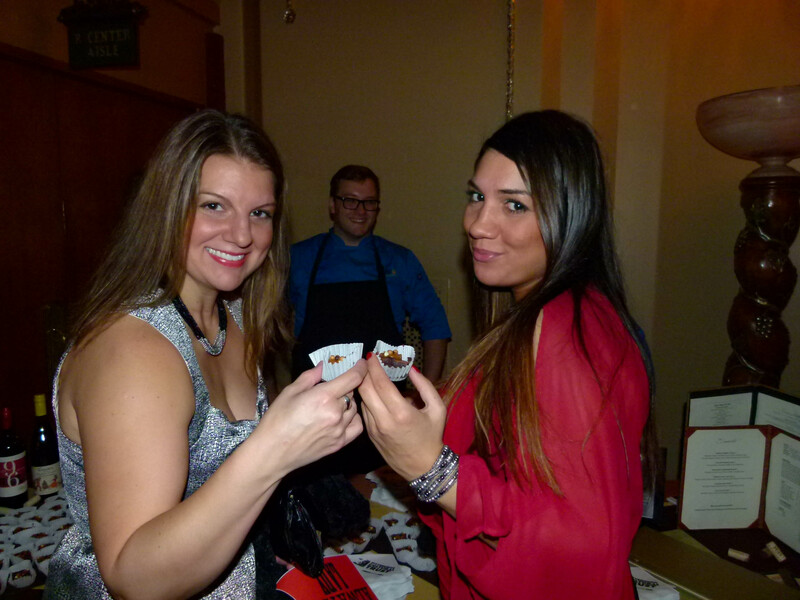 Women (and men) love chocolate, including Lisa Sipusic (L) and Alexarae Wehlau. They are ready to indulge in Flourless Chocolate Cake with Rich Dulce De Leche Cream and White, Milk, and Dark Chocolate Crisp Pearls from Sonoma Grill, as Scott Skaggs looks on. 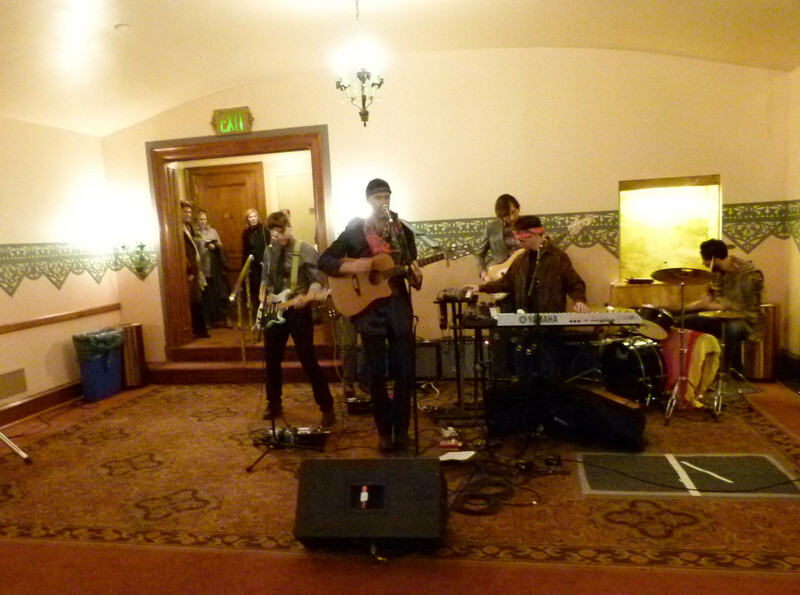 If ever a band and event were perfectly matched, it was the group Delicious Pastries performing at The Chocolate Bar event. Eating chocolate can make you a little giddy, too.